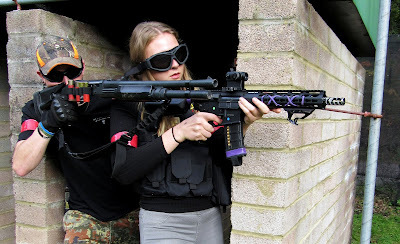 In October I traveled to the South of England to meet up with some friends and play a cheeky skirmish, during my visit they introduced me to a CQB site in Aldershot ran by Ambush Adventures – The Billet. Ambush Adventures: The Billet is a relatively new site (having been established around 18 months ago), set in an old military barracks within the heart of Aldershot. From my home in the Midlands, the site is around 151 miles so it is a fair drive for those of us in the more northern regions of the UK but is really easy to access via the M40 or M1. The site itself is easy to find as the Ambush staff have signposted the entrance - as you drive through the gates you are greeted by the sites marshals, you are checked against the list and directed to the large car park that has plenty of space for the sites players ready to start the day! Booking onto the Billet is really easy and is done by completing a form on their website, and after talking to a few players on the day it appears that this is a new booking on process which has improved on the previous method. The walk on fee is £35 which includes a lunch of two hot dogs – the game day fee is a little more expensive than the average game day fee however. Although the site books up quickly, there are plenty of chances to play the Billet as games are ran every all day every Sunday with around 40 players in attendance and they also hold Wednesday night games that are gaining in popularity. The night games run from 7.30-10pm and for a walk on fee of £15 is the perfect bargain for that midweek pew fix! The safe zone at The Billet is arguably one of the best safe zones I have seen, it’s a large room full of tables ready for the day’s activities and is big enough for their maximum player count of 50. The safe zone has a kitchen that provides lunch and sells snacks and drinks throughout the day, it is heated (which is much appreciated), has electricity points so you can charge batteries etc, it is also well lit and clean. Inside the safe zone, there are well-equipped shops for all your Airsoft needs from RIFs to beebs to eyepro – Just Cause Airsoft and Sierra Alpha Supplies. Just Cause Airsoft specialise in RIFs and Sierra Alpha Supplies focus on Army surplus and tactical kit for the avid Airsofter, the store has been going for over 4 years and like Ambush is a family run business by Simon and his son. The shop is has everything you could need (because let’s be honest – new kit is a need not a want!) and for those things that are a little more special – they have an order in service. One thing I really like about the facilities is that there is a separate toilet for women, it sounds small but it makes a big difference! The site runs a strict chrono limit of 350 maximum for AEGs and Pistols and because the site is extremely close CQB, it’s not suitable for snipers or DMRs so leave those at home! Let’s talk a little bit about the site’s staff, Ambush Adventures is a family run business, owned and operated by Christine and Charlie James. What immediately hits you about them is that they are welcoming, friendly and happy to engage in conversations with their customers. The safety brief delivered by Charlie is animated and engaging. It is clear from how they interact with their players throughout the game day that they have built a solid relationship with their customer base. Their marshals are another strong asset to their team, especially Head Marshals Tony and Dave. One thing I can commend the staff on is their professionalism and light-hearted banter which keeps morale up during the day – even during the 3pm slump. Whilst at the Billet I had the pleasure to meet a member of the Ambush team who has made quite a name for himself within the industry – Stretch the chicken from Super Mega Tactical Airsoft News and his side kick Matt. I have seen videos and photographs of the infamous stretch floating around on social media for a while, it was great to finally meet Stretch and sling some plastic with him (I tried for a chicken kill but alas I did not possess the stealth!) He was kind enough to indulge me in a tactical selfie and gave me some super sweet patches to add to my growing collection – man love de bakewell! The site itself is comprised of 2 spider buildings with multiple linked rooms that have over 30 entry/exit points which makes for varied gameplay. The buildings have an abundance of corridors full to the brim with lockers and other obstacles to fight through and around. The site utilises a mix of different sized rooms, some submerged in darkness that contain lockers, bunkbeds and other pieces of cover. There is a large amount of outdoor space around the main building where the cover is provided by the buildings themselves, shipping containers, lined fences and a variety of trees – the outside element to the site opens the doors to more game play options. Due to the close quarter’s element of the site, the gameplay however is concentrated within the building complex itself and is intense (prepare for a ricochet party!). This site is the type of CQB that really gets my adrenaline running and heart pumping! Room to room clearing, knowing that there could be an enemy round every corner or hidden away in any locker really gets the fear going! This element of fear results in an overall better performance for me personally. My favourite aspect of the site is at the very heart of the spider buildings – the toilet blocks that connects the two halves of each building together. It’s exactly what you would imagine, rows of toilet stalls with sinks and showers thrown in the mix. The toilet blocks have been jazzed up with smoke machines and speakers to distort the players field of vision and to drown out sounds in an epic guitar solo. Clearing the stalls and shower cubicles with nades, pistol and knife kills is an awesome feeling and is something I look forward to in the defend and attack games! The games the site runs are always varied and well ran. They vary from Team Death Matches, Zombie games and objective games. My personal favourites are their objective games- they give you something else to aim for than just the kill. Ambush use a variety of tech and props to really bring their objective games to life. There are two that really stand out to me: the ‘Flashy Light Box’ and the ‘Hostage Rescue’ games. The ‘Flashy Light Box’ game is exactly how it sounds, 6 objective boxes with two switches and two different coloured lights are placed in the game zone waiting to be captured by either team, once the box is located the player must a flip the switch that belongs to their colour to control the box. If the box is already under the opposing teams control, two players are required as a player can only flip on switch – so one to flip the switch to disarm the other teams light and one to arm their own. This game is always fast paced and intense, from the frantic search at the beginning to locate and arm the boxes to defending them fiercely to keep the balance of the game in favour of your team. I’ve always enjoyed this particular game mode. The ‘Hostage Rescue’ game is another of my Billet favourites, is where one team, defends two objectives that are dispersed into the spider buildings. The objectives are usually a piece of intel such as a briefcase or laptop and the Ambush flight pilot mannequin, Steve. The attacking team must complete the 3 phases in the least amount of time possible. Phase one is to capture the intel, phase two is to rescue the hostage and phase three is to transport the objectives to the extraction point. This game really encourages players to work together to capture the objectives which is what the sport is all about! The games are then reversed so both teams get to experience both aspects of the game. Ambush Adventures operate a really interesting respawn rule that I’ve not seen at any other site so far – each team has a clock at their respawn point with alternating team coloured 5 minute sections, and upon reaching the respawn clock if the minute hand is on your teams colour you can get straight back into the game, if not, you must wait until the minute hand does reach your colour – which can be an agonising wait if you were involved in a particularly intense firefight. The other players on site are one aspect of the day that really impact how I personally feel at the end of the day, and I’ve played the Billet on two separate occasions – once on a regular game day and the second time to review the site. I made a rookie mistake the second time and announced on social media that I was covering the site which meant the game day was fully booked and attracted some ‘difficult’ players, in light of this I have based this review on my experience of a regular game day as it is fairer to the site and its regular players. I encountered no problems on the day (no cheat calling or non hit taking), everyone was in high spirits and a pleasure to be around. There is a real community feel amongst the players at Ambush. There is a particular team who really stand out when I recall my visits to the Billet – Scorpion. A fairly large team of fun loving, honest lads from the South East of England who I had the pleasure to run with. They were really friendly, welcoming and you could certainly have a laugh with them. 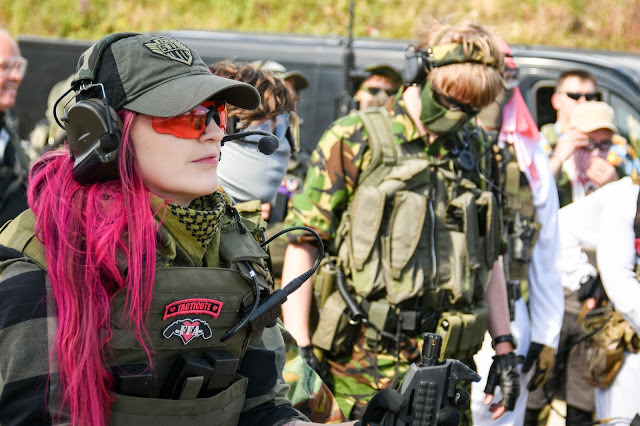 Teams and players who share the same attitudes as Scorpion really make me proud to be a part of the Airsoft community. Overall, I would definitely recommend Ambush Adventures the Billet. The site is well run by professional and friendly members of staff that take pride in their site and games they run. The games are varied and entertaining yet provide a great challenge for both beginners and seasoned Airsofters. Hardwick, K. (2016). Ambush Adventures: The Billet. Airsoft Action. 57 (January), 68-71.